Handling conflict or having challenging, difficult conversations is often a topic a client will bring to a coaching conversation. We’re never going to agree with everyone on everything. As we move through our life, our hierarchy of what we value might change. Yet others might not change their hierarchy of values. Circumstances at work change because of a new manager, a new philosophy, a new owner, and so on. There are so many reasons which are normal that mean we’ll have a conflicting view with another person, personally or professionally. There are many great books written on this topic, and some I have read. In this article, I’m focusing on how to use knowledge of a specific model to inform a coach approach in a coaching session. Many coaches will bring out a model and teach the model. That, to me, isn’t the starting point, but could be the ending point in a coaching conversation where the client wants to know more. We get attached to our models, yet for a coach, it’s the ability to use models and knowledge to inform coaching questions and observations that is most powerful. 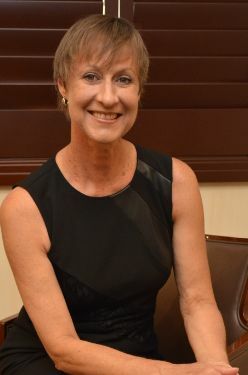 That’s because we give our client the opportunity to discover connections for themselves rather than using an expert approach via a model. Please hang in there with me as I go through my definition of conflict, the model I’m referring to, then how to use in a coaching approach. There are many times we have a different point of view than another, yet it doesn’t feel personal. We can appreciate their viewpoint, and not make the person wrong for thinking that way, even if we don’t agree and never will agree with them. The art of debating is one that is useful, and perhaps could be a mandatory skill for everyone to learn in school. In a debate, we learn the art of presenting information and beliefs, hopefully in a respectful way. Yet debate is not what often occurs. One person is so invested in being right according to their beliefs, that they can’t or won’t respectfully accept that someone else can have a completely opposite or different view that is equally valid. Or one person assigns ‘poor intentions’ to the other person rather than seeking to understand what their thinking is behind their action. I remember when I first moved to the United States in 2001. As an Australian, I was used to being sarcastic and off-handed with comments, and was surprised when this wasn’t appreciated by Americans. Some thought it funny and endearing, while others found it offensive. I first had to realize I was being sarcastic, which is such an ingrained part of the Australian psyche I didn’t even realize it wasn’t normal for another culture. Once I was aware of this, I understood the validity of what others were saying, and decided to stop that behavior. It took time and effort, and a desire to listen to how others received my sarcasm. One of my highest values is to learn and keep evolving as a person, as that is a motivator for me in my life. This is in service of my [inner] ideal vision of myself and to match most closely with my [outer] behavior. Externalize rage or anger toward the person, where we verbally ‘lash’ out at the other person. Internalize rage or anger where we seethe about the person. Gossip and speak poorly to others about the person. This could become collusion with others in an effort to have others agree with the way we view that person. To make us right and ‘them’ wrong. The latest trend is using social media to ‘speak our mind.’ The written word is open for misinterpretation anyway, as we read words others write, adding our own voice tone and intonation. A model I was introduced to in 2006 gave me a wonderful way to start to pull apart what might be at the heart of a conflict. You may have a different model you like to reference, and that’s totally okay. 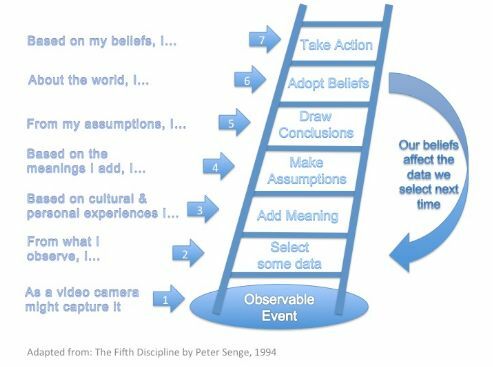 The model is called, “The Ladder of Inference” and describes the thinking process that we go through to get to a decision. 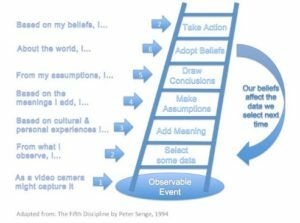 The thinking stages can be viewed as rungs on a ladder. This whole thinking process occurs very quickly and without realizing all the connections and assumptions we’ve made to get there. We might only talk about the decision or action we’re going to take and not reveal how we climbed the ladder to that decision. The first recognition, not really articulated in this model, is emotions. We usually have an initial emotional reaction to what another says or does. This might be internal or externalized emotion. Mostly it’s going to be some form of anger, whether we call it anger, rage, disappointment, frustration or something else. 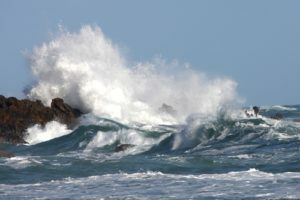 As quickly as possible, I seek to take myself away from the situation so I can process my emotional reaction with any number of ‘visualization’ or other tools I have at my disposal that get into the core of the feeling and dissipate it. I may go to the restroom if it’s in-person. If on the phone, I get off the phone, and call back later. Maybe I go to a Bikram Yoga class and sweat it out! Or the gym, or a walk. My best strategy is to wait at least overnight to respond in-person, by phone, or via text or email. There is something scientifically proven in what the brain does in processing overnight, and it works for me! I almost always wake up with a more balanced perspective. And from that place, I can work through the stages in the Ladder of Inference. The basis of this model is separating data from meaning. Starting at the bottom of the ladder, what is the event, then what data am I paying attention to (and what am I discounting). We then add meaning to the data. The possibly most ‘damaging’ part about this model is beliefs we hold, which determine the meaning we then assign to the actions of another. Not only for this event, but then we make assumptions that inform future events. The next time we encounter something similar to this situation, we immediately bring in our belief and assumptions as if they are fact, rather than realizing that we don’t have all the data (facts) about this particular situation. As a coach, seek first to use your knowledge of a model to inform your questions, then carefully consider if it’s still of value to the client to share the full model. Allow our client to discover and make meaning for themselves. And perhaps they’ll design their own model that makes sense for them along the way. Two new Mentor Coaching Group Programs are now filling, commencing February 2019, on a first come, first reserved basis. Maximum of 6-10 participants per group. Thank you for sharing this Carly. I’m confident this framing of how to approach conflict will serve me well in my work with clients. I can also see how helpful it might be in navigating some of my life’s more challenging personal relationships, which have been especially difficult given today’s political climate. Hi Andrea! I’m glad you found this model and thought process useful. It certainly has helped me enormously over the years. This is helpful. I like your questions. These will help those of us using the Everything DiSC Productive Conflict assessment make better use of it in coaching situations. It can be such a challenging topic once it gets past the concept stage and into reality. Thanks fro sharing the model. That’s great Tina, and makes me happy the article is of value to you!